When you’re running a productized service business, it’s easy to get caught up in the service side of things since most of us come from a background in consulting and billing by the hour. 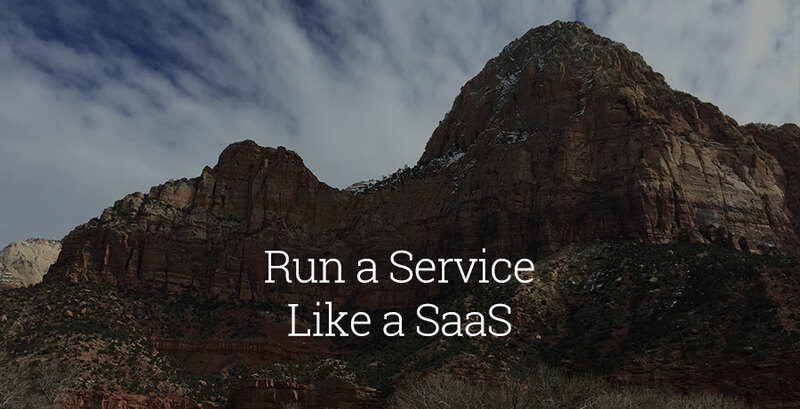 But you’d be much better off if you run your productized service business as if it were a SaaS, because in many ways, they’re not that different at all. I’m writing this article from the plane on my way home from MicroConf, a conference with a heavy focus on SaaS. It’s an annual gathering where founders share ideas and tactics for running and growing a software as a service business. I don’t run a SaaS today. Yet nearly all of the advice I consumed at the conference this week applies perfectly well to my productized service business. So I thought I’d share those similarities between running a productized service and a SaaS. Nearly every piece of advice aimed at software entrepreneurs revolves around the idea of product-market fit. That is—Nothing else in your business will work until you absolutely nail product-market fit. That’s certainly true of a productized service. And like software, too often it goes overlooked or is not dealt with the sense of urgency that it deserves. In a productized service, it’s easy to fall back into our old ways of serving any and every client with every custom solution under the sun. But this only lures us further and further away from true product-market fit. Once you figure out who your best customer is and their most-painful problem, only then you’ll be on your way to nailing a solution matched to that specific need. That’s product-market fit, and once you achieve it, you open up a whole world of strategies you can use to insert yourself and grow within this market. But even then, you may not be out of the woods yet. Not every productized service has to use a recurring revenue model. But most do, and this article assumes a recurring component. And with recurring, comes the unfortunate reality of churn (a.k.a. cancellations). Although you can’t avoid all cancellations, you can and should learn from them. This is how you reduce churn. By understanding all the most common reasons why a customer might decide to cancel, then actively tweaking your service to reduce the likelihood of these cancellation reasons from happening again. In this sense, the benefit of a productized service over a SaaS is it can be easier and faster to iterate your service to reduce churn. In a typical productized service you’re dealing with tens of customers, not hundreds or thousands. This means you can spot trending cancellation reasons faster, and even understand them better since you’re likely closer to each individual customer. In a SaaS, it can take a long time to release updates to your software, since it often involves reworking legacy code. But in a productized service, iterating can be as simple as editing an operating procedure in a Google Doc. SaaS and productized service owners alike win they stay laser focused on reducing churn by iterating on the value your service provides and/or who gets the most value from it. Reduce churn and the trajactory will stay trending up and to the right. Every SaaS with an active user base receives plenty of feature requests. If the product team is smart, they’ll only add a small fraction of them to their roadmap. It’s all about reducing “bloat” and only implementing new features if they’ll benefit the majority of the user-base, not only a few loud customers. A productized service is best run with this same mentality. However, this is an area that can be more difficult to remain disciplined in the way you can with a SaaS. Customers of your productized service oftentimes don’t fully appreciate why every one of their special requests can’t be honored by the productized service. Understandably so; It is a service and it should be able to adapt to the client’s needs, right? Well, in fact, it’s really in the client’s best interest that the productized service sticks to it’s standard way of delivering it’s solution (assuming the client truly has the problem that the service is designed to solve). When the team is able to execute the delivery of the service in the same way every time, it’s able to keep quality and reliability high. But every variation or “special case” adds a potential for something to slip through the cracks or be missed in QA. If the special request is really just a non-critical “nice to have”, it may not be worth the added risk of mistakes. The more special-case variations there are, the harder it is to streamline the process. That can increase cost to deliver the service, and they may result in a potential price raise for the client. A common benefit of buying a productized service is the built-in efficiency at a great price. A good productized service with great clients will handle feature requests the same way as a SaaS. Only when they can be rolled out to the benefit of all clients and baked into the standard process. MRR, LTV, CAC, Leads, Conversions. These are just as important when you’re marketing a SaaS as they are when marketing a productized service. Remember, if your productized service has achieved product-market fit, then you have a product to sell. That means you can build a marketing plan to actively attract your most ideal customers and lead them through a sales funnel to purchase your solution. Based on the monthly recurring revenue (MRR) from one customer, and an understanding of the average lifetime of a customer’s subscription, you can get your customer lifetime value (LTV). Then you can figure out how much you’re able to spend to acquire a customer and over the course of running and measuring your marketing campaigns, figure out your cost to acquire a customer (CAC). In the same way a SaaS measures conversions of trial users to paying customers, your productized service can measure conversions consultation requests to signups. At the end of the day, marketing, operating, and growing a productized service isn’t all that different from a SaaS. So you might as well adopt the same game plan. Use this roadmap to guide your thinking as you look to grow your productized service like you would a SaaS.